Take a look at this precious rosette! Well, I have a tutorial for you today sharing how ridiculously easy it is to make! Can you tell I'm excited lol? You can make a rosette using a variety of ribbons, but I found that organza was the easiest to manipulate and made the prettiest bloom. 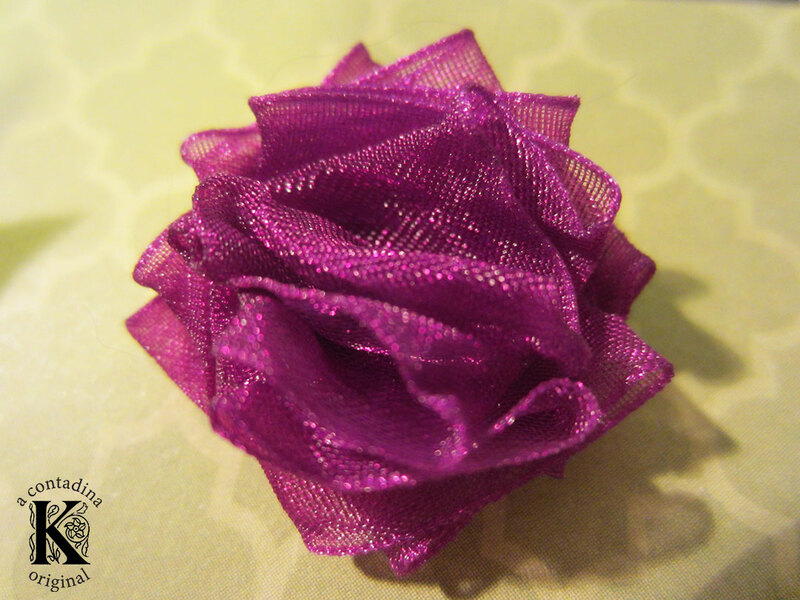 For this rosette, I used Plum Organza from the Really Reasonable Ribbon Shop in the 7/8 in. width. 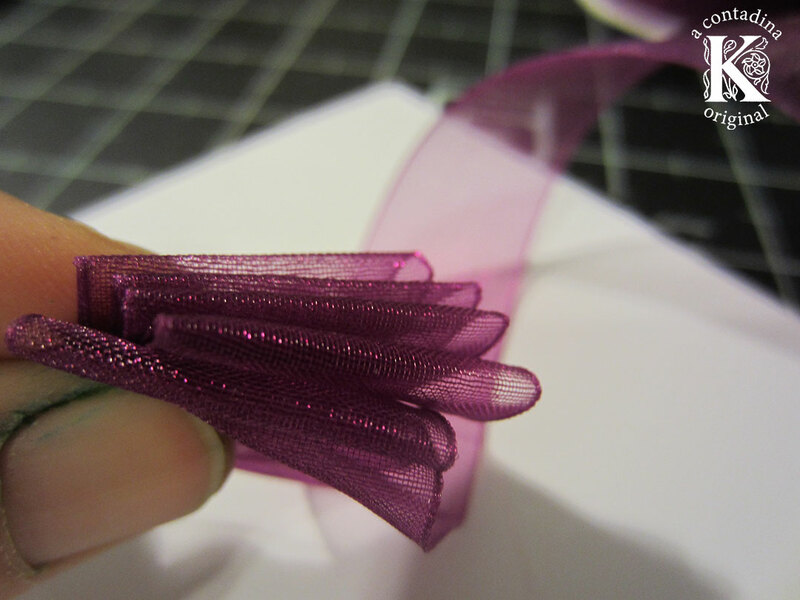 First, fold the corners of your ribbon inward to make an arrow shape. Make sure this is neat and hides any stray fibers as it will be the top of your flower and visible. 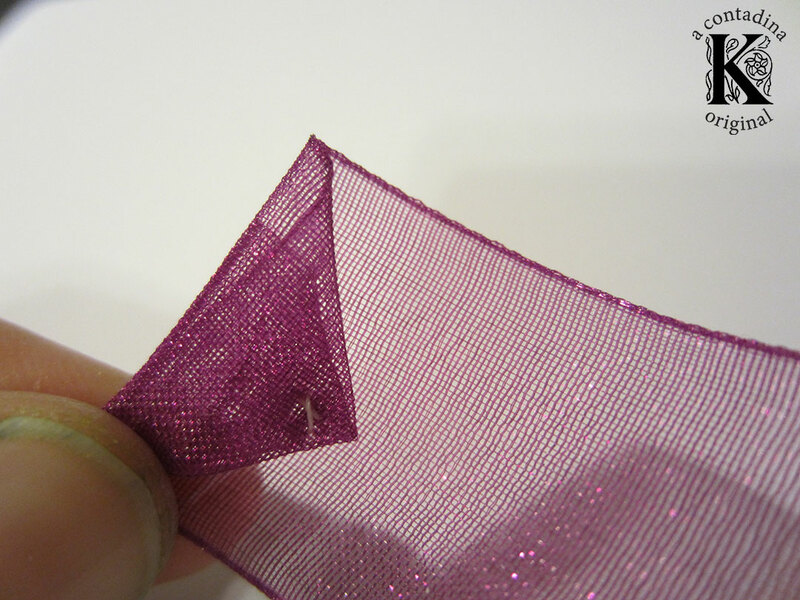 Then fold this portion over so that the raw edges are completely hidden as shown below. 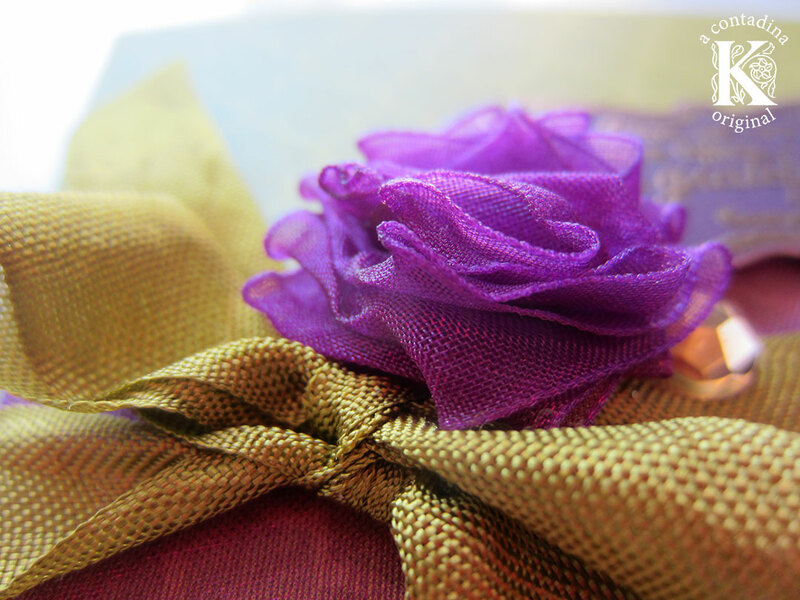 At the point of your folded ribbon, stitch through all layers with a matching thread. I used a contrasting color just to illustrate clearly. 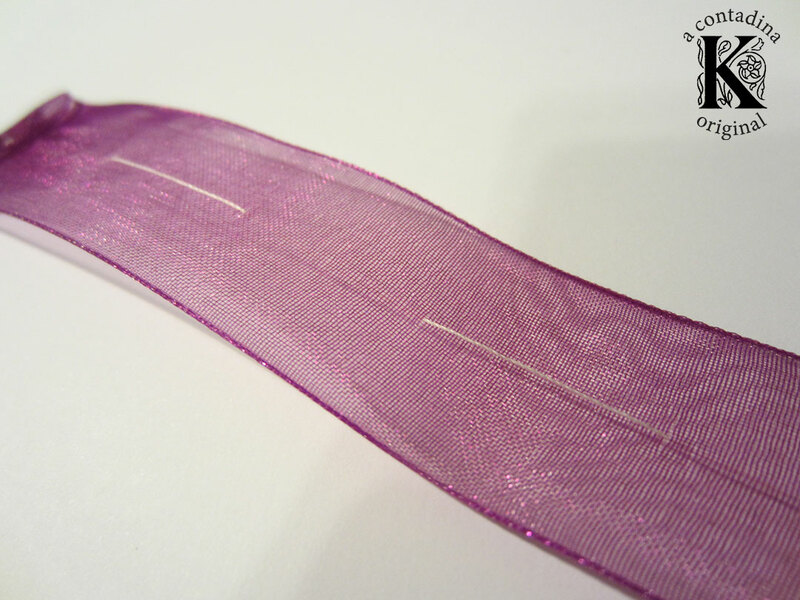 Then do a running stitch down the length of your ribbon at intervals that approximately match the width of your ribbon. For this 7/8 in. width, I did a running stitch about 11 in. long, and then pulled the thread to gather as you see below. ...Please excuse my gross finger! Ewww! I had been doing a lot of mixed media and the ink just wouldn't come out... Apologies lol! Back to my tutorial - after you gather tightly, twist your bloom so the folds aren't directly on top of each other, and backstitch to secure on the underside. One simple knot might come loose, so a backstitch is advised, both at the origin and here at the end. This is how the bloom looks at this stage. I've been heating my organza a ton lately and ending up with really pretty, natural looking curves in my floral creations. At this stage, I carefully set my heat tool on the bloom - one must be careful not to burn the fiber. 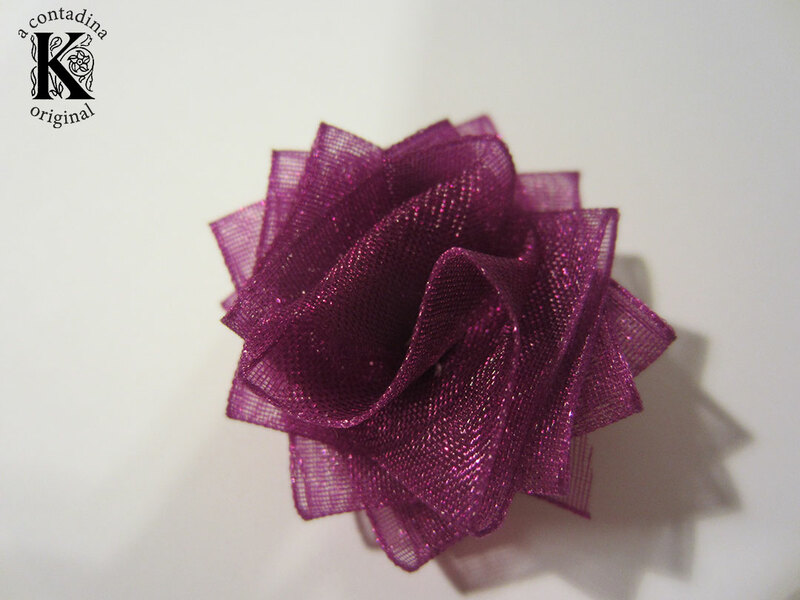 And voilà, you have some natural looking curves on a pom pom rosette which shimmers spectacularly in the sun. 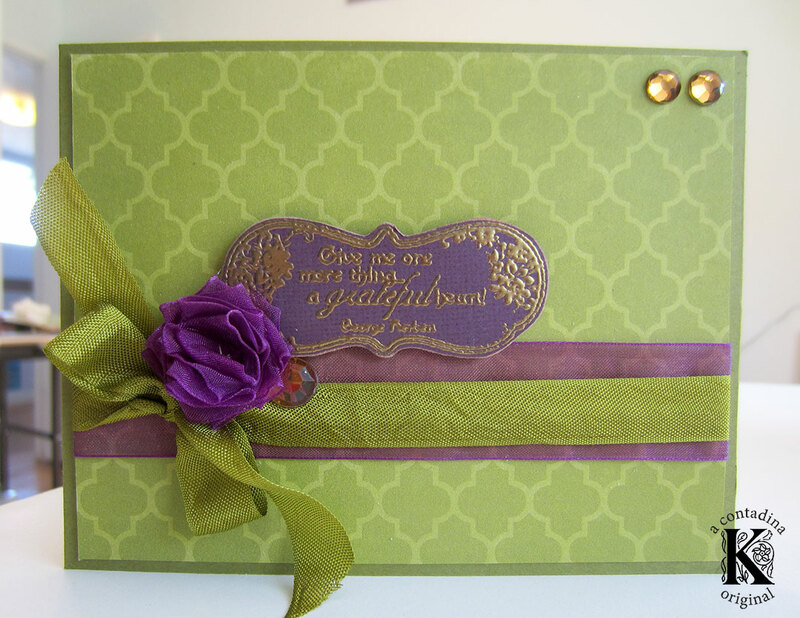 Here it is on a simple card project. Thanks so much for visiting here with me today for this super easy tutorial. If you are interested in more of my work and tutorials galore, please visit me on my blog! Oh, must try today! Thank you! I never thought about heating the organza afterwards. Great tip! Oh, this does look easy. Thanks!